The Ministry of Defence has confirmed it has withdrawn the missile capability of one warship and is planning to do so from another currently on deployment. HMS Southampton, will return from the South Atlantic in December, and will then join HMS Exeter which has already been stripped of its Sea Dart missiles. The Portsmouth-based Type 42 destroyers will be taken out of service next year. The MoD said both vessels would still be able to defend themselves and carry out "a wide range of tasks". An MoD spokesman said: "This decision has been made after careful consideration and is necessary to ensure support to the longer-running Type 42 destroyers can be sustained properly." He said HMS Exeter was due to be the next Type 42 to be retired after more than 25 years in the front line and HMS Southampton, which is the second oldest Type 42, will follow in 2009. 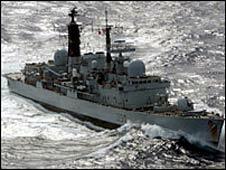 He added: "HMS Exeter and HMS Southampton will continue to be capable of a wide range of tasks. "They are armed with a 4.5in (11cm) gun and close range weapons systems and they carry a Lynx helicopter, which can deploy torpedoes, anti-ship missiles or a machine gun. "Air defence for the fleet will continue to be provided by the other Type 42 destroyers that will remain in service until gradually replaced by the Daring class Type 45 destroyer, the first of which will enter service in late 2010."